There are seemingly hundreds of technologies and techniques for remotely triggering a DSLR today. 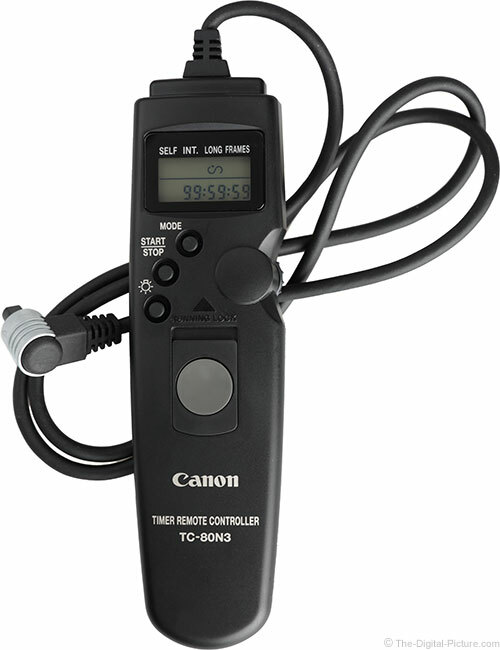 However, I still very frequently use a slightly old-school but very reliable and useful device – the Canon Timer Remote Controller TC-80N3. This remote release requires no smart phone, tablet or other computer to make it work. It weighs only 3 oz (85g) including the battery and measures only 1.57 x 0.8 x 5.63" (40 x 20 x 143mm). How long does your smart phone or tablet battery last? The TC-80N3's single CR2032 battery is rated for about 3 years of life and I have 9 years on one of my lightly used ones. This device does not even have a power switch – it is always on (unless you remove the battery). Before reading any further, make sure that your camera has an "N3" remote release port. Canon's mid and high end cameras have one. The Rebel series models do not. The basic reason for using a remote release is to release the camera shutter without causing movement or vibration to the camera. If this basic functionality is all you need from a remote release (and you camera does not support the awesome little Canon RC-6 Wireless Remote Release), the less expensive Canon Remote Switch RS-80N3 is the more affordable option for you. The RS-80N3 is shown to the right of the TC-80N3 below. 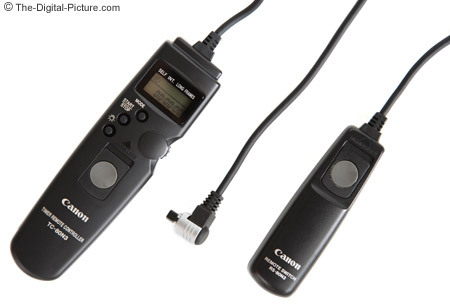 The TC-80N3 and RS-80N3 have the same release button (they even appear to share the same parts) that features the same half and full press shutter release as found on the camera. This instant release button is always available and can be slid forward while depressed to lock in the depressed state (called "running lock") which hold the shutter open if the camera is in Bulb mode. This feature is great for capturing lightning at night, for fireworks photography and for other similar long exposure uses including while using a black filter with an external timer. Use the Self-Timer function to delay the start of an exposure for a specific length of time – from 1 second to 99 hours, 59 minutes and 59 seconds. It is unlikely that many of us will ever need to exceed that longer timespan. The interval timer allows pictures to be continuously captured with the set amount of delay between them – from 1 second to 99 hours, 59 minutes and 59 seconds. The interval time period is started with the beginning of each exposure. If you want 30 seconds of shutter-closed time between exposures, add 30 seconds to your exposure length to get the interval time you want. The interval timer feature is frequently used for time-lapse photography. When using flash with the interval timer, be sure to allow enough time for the flash(es) to adequately charge between shutter releases. The full recharge duration can be several seconds or longer. Canon's DSLRs unfortunately allow specified exposure time lengths of only up to 30 seconds. While 30 seconds can cover a high percentage of DSLR uses, there are situations that need longer exposures – such as those often encountered when using an above-mentioned 10-stop neutral density filter. The Long Exposure Control mode establishes exposure durations between 1 second and 99 hours, 59 minutes and 59 seconds. Set the camera to bulb mode when using this feature. Also typically used for time lapse photography is exposure count control. Exposure count values can range from 00 (to trigger single, infinite or continuous shooting) to 99 and the interval defaults to 1 second if an interval time is not selected. You can also capture HDR images using this feature in conjunction with the camera's exposure bracketing feature. The above-bulleted four functions are available individually or they can be combined as desired. For example, a 2 second self timer can start a long exposure or other programmed function. To cancel use of a specific feature, set the time or number of exposures of the respective mode to 0. The uses covered by the TC-80N3 functions and combinations of functions are huge. The Mode button is used to select one the features. Each press of this button allows the next feature setting to be seen/changed. When a desired feature is selected, that feature's time or count can be updated using the jog dial button on the right side. Pressing in on the jog dial button causes the feature's value flash on the LCD and allows it to be changed via a rolling of the jog dial button. For example, to select a time value, press in on the jog dial repeatedly until the seconds, minutes or hours are flashing and roll the jog dial in either direction to change the selected time value. Exposure count is set similarly, except there is only one value to set. It would be nice to have a full-reset button available. The Start/Stop button is used to (surprise) start and stop (if necessary) a sequence of exposures. The LCD shows the status of the programming including time countdowns. A battery icon will show when battery is low and will blink when the battery is very low. The Display Illumination button also does just as its name implies – it illuminates the LCD panel backlight for 6 seconds. Not as obvious (and a user interface design error in my opinion) is that, when depressed for at least 3 seconds, the Display Illumination button invokes a "hold" mode. In "Hold" mode, all buttons except the Display Illumination button are locked to prevent accidental settings changes and "HOLD" shows on the LCD. To clear the hold mode, hold the Display Illumination button for at least 3 seconds to toggle off the mode. 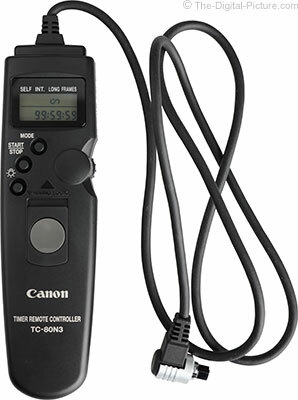 The Canon Timer Remote Controller TC-80N3 is very light and nicely made. The cord length is 2.6' (80cm). To prevent the remote controller from bouncing off of the tripods legs and/or getting caught on something, I suggest attaching the release to a leg of your tripod (perhaps with a pony tail band) if moving with the remote attached to the camera. If your camera has a removable N3 port cover, it can be plugged into a small hole in the back of the TC-80N3. The D30 was the last Canon EOS camera to have the easy-to-lose plug. If I am shooting still life from a tripod, I almost always use mirror lockup. What you need to know is that mirror lockup must be triggered using the camera's shutter release (or a press of the remote release button) as the camera and remote are not smart enough to figure this out using just the release, unlike when using the camera's 2-second self-timer. Or, program the remote for 2x as many shots with the releases alternately triggering mirror lockup and shutter release. Forgetting this step can mean that you come back minutes later to find that the remote controller only triggered mirror lockup – not the exposure. Note that I usually use and recommend manual focus while using a remote release. The price of the TC-80N3 is not cheap and less expensive generic versions such as the Vello Shutterboss Timer Remote Switch are available. While I don't like to pay more than I need to, I have stayed with the trusted Canon brand for this important part of my kit. At least one of my Canon TC-80N3 remote controllers are with me if I am traveling with a tripod and quite often one is in use when I am using a tripod. The functionality provided by this simple, lightweight device is extremely useful, making it easily worth being part of any amateur or professional's kit. If you have a tripod and a Canon camera sporting an "N3" port, add a TC-80N3 (or similarly functioning device) to your kit.